At October 1, 2011, the Company had an outstanding balance of $195 million on the revolving credit facility and unused borrowing capacity of $417 million under the revolving line of credit subject to the solvency of our lenders to fund their obligations and our borrowing base calculations. 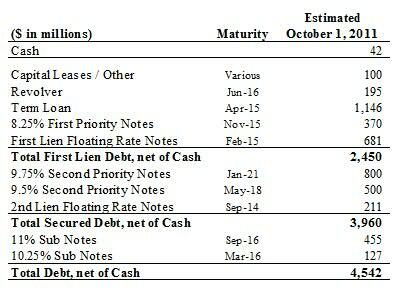 The Company's outstanding debt consisted of the following at the end of the fiscal year. In September 2011, BP Parallel LLC invested approximately $39 million to purchase $41 million aggregate principal amount of our 10¼% Senior Subordinated Notes and $2 million aggregate principal amount of our Second Priority Floating Rate Senior Secured Notes. The repurchases resulted in a net gain of $4 million. As part of the Company's preparation of its financial statements for the fiscal year ended October 1, 2011, the Company is conducting its annual evaluation of the value of its goodwill, long-lived assets and intangible assets for impairment, as required under by the Goodwill and Other Intangibles standard of the Accounting Standards Codification (ASC). The estimated results above do not include any impact from impairment charges recorded under the ASC. As part of the first step of the annual evaluation, the Company has identified an impairment in the Specialty Films segment. The Company is continuing with the second step of the evaluation process for the Specialty Films segment in order to identify the amount of the impairment and will complete this evaluation prior to reporting audited results. The impairment charge is a non-cash expense and may be in excess of $150 million of the segment's $240 million of goodwill.